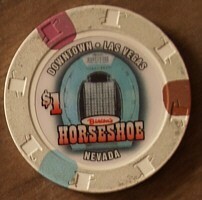 Horseshoe Hotel One Dollar Chip. ? Nearly new (but used) one dollar chip. The Horseshoe has changed owners. This chip has become a collectible.